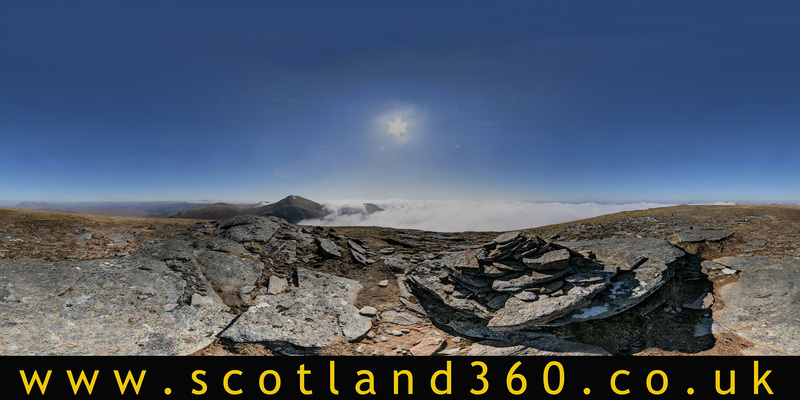 A recent commission from BBC Scotland had engaged me to photograph 360° panoramas from the summits of local mountains for incorporation into a new project. With this work in hand, I saw further possibilities for developing 360° panoramic mountain photography and so my plans took shape. An early morning start in mid April took me to Sgurr Breac and A' Chailleach in the Fannich hills to capitalise on what promised to be a superb day out according to the weather forecast. Parking up at the start of the track towards Loch a'Bhraoin at just before 06:00, it was looking good. Early morning mist was hanging around the summits but the skies above were clear and cloudless - the promise of a rewarding day on the hills. There were real treats in store during the day. Blue cloudless skies and early morning mist over the mountain summits developed into two superb mountain phenomena. Approaching the summit ridge on my way to Sgurr Breac, I was lucky enough to see myself in a Brocken Spectre. Formed by my own shadow cast on the mist below by the sun above, they're always great features to see and to experience. I've seen many Brocken Spectres on the hills in the past, but this was certainly one of the best. Further up the hill and towards the summit, there was another real treat. To the south lay a blanket of cloud, as I found myself above a complete inversion. Sgurr nan Each and Fionn Beinn were nudging out of the top of the cloud, whilst further to the west, the tops of the Torridon hills and Slioch were starting to clear. Click on either of the images above to access a Virtual Tour of the Fannich Mountains. Select any of the mountains from the opening map and enjoy touring the summits across the seasons! On an early start to the day, looking up at A' Chailleach, morning reflections on a calm Loch a'Bhraoin and a long distance perspective on the Corrag Buidhe pinnacles on An Teallach. The views from half - way up the ridge looking over to An Teallach, Sgurr nan Clach Geala and up the ridge towards Sgurr Breac. Mist spilling over the top of the Sgurr Breac / A' Chailleach ridge whilst the distant hills to the west begin to clear the early morning mist. Nearing the top of the ridge, as the mist spilled over into the corrie the conditions became perfect for the display of a Brocken Spectre. The high sun and the low mist created the perfect conditions for casting my shadow onto the mist below with a rainbow halo projected around my shadow. And a further treat was in store as I made it onto the ridge line. Looking over towards the south an inversion, caused by the colder air sinking into the glens, was was providing another superb mountain phenomenon. The summits of the Glen Affric hills were sitting just above a thick blanket of fog. Looking further west, the summit of Slioch was just visible above the layer of cloud. I was treated to some superb long distance views over snow capped mountain summits above the inversion. 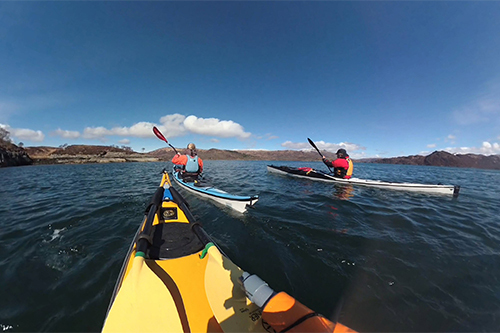 This was more than I had hoped dare for in setting out to capture 360° mountain panoramas. 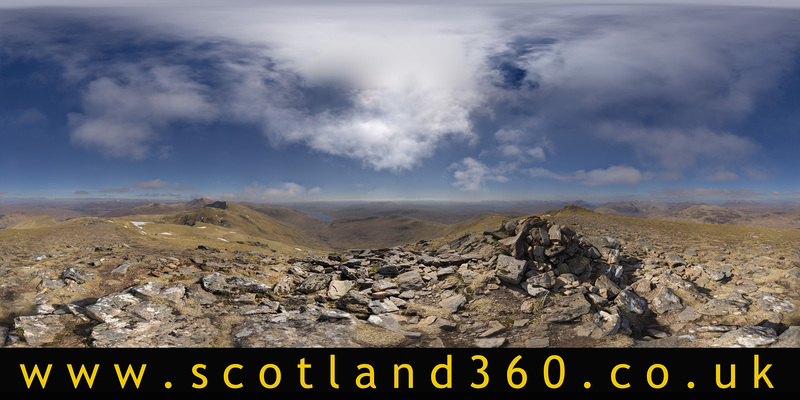 With the panorama of Sgurr Breac captured, it was time to move along the ridge to the neighbouring summit of A' Chailleach for the second 360° mountain summit panorama. The mist had cleared by this point and the long distance views were starting to open out with a view back along the ridge to Sgurr Breac. 360° photography requires not only the camera but also a rigid tripod to support a panoramic head. A good supply of camera batteries and memory cards is also essential as I make sure that I take several panoramas from each summit to allow me to select the best of most representative photographs when back at my PC. 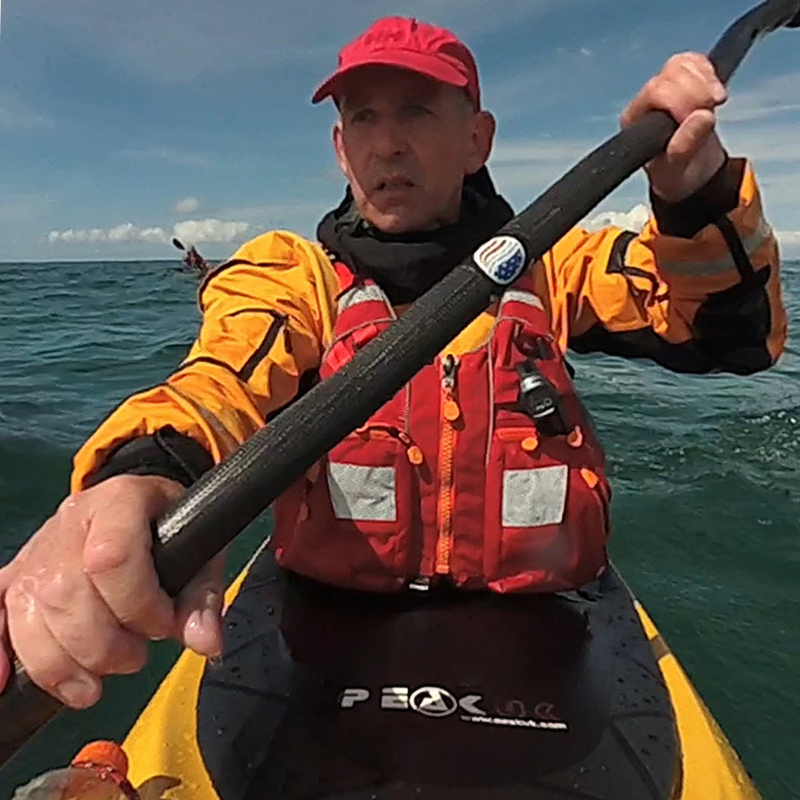 As you can see from the photograph of the tripod 'in situ', high contrast light and a good deal of dynamic range can also present their won challenges. I always try to photograph as close to the summit as possible to ensure that the final output provides a sense of 'being there'. Long distance views to Fisherfield, the view along the ridge and some great summit views made this a real day to remember. It's not often that Scottish mountain photography is as good as this! From the left, Slioch, An Teallach, the Corrag Buihe pinnacles on An Teallach and the summit of A' Chailleach. Classic mountains and classic oportunities for photographing Scottish mountains in such great conditions. Leaving the summit views, it was time to descend. From the left, Slioch, An Teallach, Slioch and the view back up the ridge. I’m Angus Mackie, a professional photographer based just north of Inverness on the beautiful Black Isle. I'm on the North Coast 500 and am well placed to discover most of the Highlands. The iconic scenery of Glen Affric and the Cairngorms are close by whilst many of the wild and dramatic locations on the west coast are within easy reach.